The Perth Mint of Australia has started accepting orders for the 2012 Christmas Locket 1 oz. Silver Proof Coin. The locket insert of the coin is filled with semi-precious gemstones of various colors. Just in time for the holiday season, this coin pays homage to the tradition of giving and receiving coins as a token of respect, affection, and esteem. 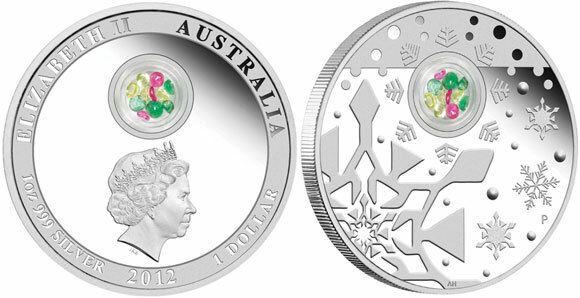 The reverse of the coin features an abstract design by Aleysha Howarth which is inspired by the shapes of snow crystals and Christmas ornaments. A transparent locket is included, visible from both sides of the coin, containing an assortment of semi-precious gemstones. The obverse of the coin features the Ian Rank-Broadley effigy of Queen Elizabeth II. A circular ring contains the inscriptions “Elizabeth II”, “Australia”, “1 oz 999 silver”, “2012”, and the legal tender face value of “1 Dollar”. Each coin has a diameter of 40.60 mm and maximum thickness of 4.50 mm. The silver content is 1 troy ounce with the coin struck to proof quality. The coin is presented within an illustrated gift card, which opens to provide a space to write a personalized message. The mintage is limited to 5,000 pieces and delivery will begin from November 1, 2012. Please visit the Perth Mint product page for additional information or to place an order. Very unique and impressive ! I generally dont like x-mas coins. After looking at this coin I may have to buy one. Unique and attractive design. For the price I am not overly impressed with the packaging though. I like the semi-precious gems (whatever that is) Nice price tho.